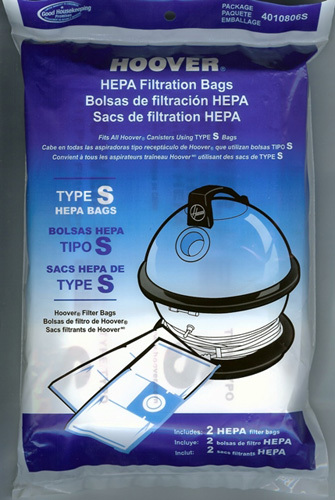 For all Hoover Canister cleaners using type S bags. HEPA bags trap 99. 98% of all particles the pass through the bag, down to 0. 3 microns. Traps 99. 98% of ragweed and common Grass Pollens. Filters a wide range of airborne particles, including many pollens and cat dander, spores and other allergens. Electrostatically charged liner enhances the capture of extremely fine particles Ideal for many with allergic or dust related discomforts. If you have allergies these bags are a must.